Ring Metal Detectors For Process Control – Foremost Machine Builders, Inc.
Ring metal detectors or sensors are electronic devices for detecting the presence of unwanted metal contamination in a flow of material moving through a pipe. The ring sensors used in our metal separating systems can also be used as singular components in other industrial applications. For example, they can be used assensors for piece counting or for ejection control of stamping parts, for wire breakage monitoring or for the detection of metallic objects. The output signals of the ring sensors can be used for controlling, regulating, signalling or for evaluating processes. We provide a large program of ring sensors that differ in design, sensitivity or the type of the output signal. Enclosed in metal casings, our ring metal detectors are used to all types of metal. The pass openings are mainly round and the detector casings are made of metal which shields them against external magnetic influences. If metal is registered, an electrical impulse is available at the output end of the transistor. The transistor outputs have static or dynamic switching behavior, depending on the ring type. Ring detectors in metal casings can be obtained with round pass sizes of 20 to 300 mm with various sensitivity levels and design shapes. Certain areas around the detector must be laid out in such a way that they are free of any moving metal parts prior to fitting the ring detectors. Enclosed in plastic casings, we also offer ring detectors for detecting all types of metal. They come in sizes of 6 to 30 mm in a special space-saving casing shape. These tiny detectors are predominantly used in the automation industry and to a lesser extent for metal detection. Unlike the ring detectors enclosed in metal casings, these plastic casing detectors are not isolated against external ambient influences. The ring sensors used in our metal separating systems are also used as single components in many other applications. They can be used output counters for counting screws or bolts, as discharge monitoring devices for stampings, wire breakage detectors or metal detectors. The output signals of ring sensors can be used for control, signalling or evaluation in many different processes. All our ring detectors are operated using switching amplifiers. The switching amplifier provides the supply voltage and other processes which are controlled using isolated relay contacts. The switching amplifiers have transistor outputs, depending on the model, in order to pass on the ring detector’s signal bounce-free to an SPC. The casings are suitable to be snapped onto industrial top hat rails. The short output signals of the dynamic ring detectors are extended timewise with the switching amplifier. Only static ring detectors can be operated without switching amplifiers. Analog – When a metal particle passes the active magnetic field inside the ring an analog voltage value of 1 – 9 V is generated, depending on the size, structure and properties of the metal particle. Metal detectors with an analog output are not recommended for the detection of small pieces of metal. They are predominantly used to inspect broken wires or to guide wires. The output signal is usually transferred onto a switching amplifier. Dynamic – When a moving metal particle passes through the active magnetic field of the ring the amplifier gives a very short output signal for at a couple of milliseconds. Detection of the metal depends on its size, structure, properties and orientation in the magnetic field. Minimum and maximum levels of sensitivity are set using the potentiometer. Since the dynamic ring is only available in NPN versions, its output signal will decrease once metal is detected. Ring detectors with dynamic switching performance have extremely high sensitivity and are used in metal separators for plastics. Static – In a static ring detector, no movement of the metal is required. 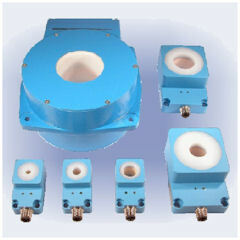 These detectors are used to ascertain quantities or to control the ejection of larger metal parts. Once a metal particle passes through the magnetic field inside the ring, the amplifier generates a constant output signal for the duration of metal detection. Detection of the metal depends on its size, structure, properties and orientation in the magnetic field. The static ring detector is available in both NPN and PNP versions. In the PNP version the output signal will increase from 0V to +24V once metal is detected. Since static sensors can detect bigger metal parts, they are mainly used to count metal parts or to check if a special metal parts exists or not. This is done without causing any mechanical stress or contacting the product. Ring detectors with the dynamic output signal are recommended for the detection of small metal paticles.